Parabens are a chemical used in cosmetics and some foods as a preservative. You can spot them in the ingredients list easily because “paraben” is part of the name. You might see propylparaben, butylparaben, or any other combination. Multiple types of parabens are included in most cosmetics because each type preserves against a certain type of organism, so the more parabens, the more effective the preservation. The problem is that parabens absorb through your skin, meaning that even if you don’t ingest them orally, they’ll end up in your body. The FDA says that they’re safe, but parabens have been proven to mimic estrogen in the body. That means that they can cause reproductive issues and possibly breast and other types of cancer. Phthalates (pronounced as if it didn’t have a “ph”) are another common ingredient in makeup products, and they’re plasticizers. That means that they add flexibility and durability to cosmetics. These chemicals are typically added to plastic, so what place do they have in cosmetics? In your makeup, phthalates are used to help fragrances last longer and help lotions penetrate the skin which means that just like parabens, you’re absorbing phthalates through your skin. Again, there’s debate about the safety of phthalate; several studies have linked phthalates to lower birth rates and premature births, and there are other studies that suggest a link to asthma. Phthalates are often abbreviated on labels (for example, Dioctyl phthalate gets abbreviated to DOP), but when it’s spelled out, you’ll see phthalate in the name. Fragrances are pretty self-explanatory, but what isn’t so obvious is what’s in them. The FDA doesn’t require any companies to list exactly what is in their fragrance blends because that can be considered a trade secret. So to keep the competition from finding out how to copy the scent, they can just list “fragrance” in the ingredients list and call it a day. What that means for you, though, is that there could be absolutely anything in that proprietary blend. Anything. Fragrances can be an allergic trigger due to the scent, but fragrances can also end up absorbed through the skin and wind up in breast milk. Scary, especially when you don’t know what those fragrance ingredients are. Bismuth oxychloride is common in mineral makeups, especially in those that claim to use only “all natural” ingredients. Bismuth is a leftover produced when lead and copper are refined. It’s mixed with chloride, which is a chlorine compound, and water. Bismuth oxychloride is also called synthetic pearl, and it’s common in cosmetics that have a shimmer effect. It’s used also to thicken cosmetics and to absorb oil. Bismuth oxychloride has a distinctive crystalline structure and some people with especially sensitive skin may find that it irritates them. The first thing that you can do to start using safer cosmetics is to read the labels on everything that you put on your skin, in your hair or in your body. Yes, this is time consuming at first, but if you don’t know what’s in the products you’re already using, you won’t know where you need to make changes. A great resource is the Skin Deep database from the Environmental Working Group. Simply search for the name of a product and the database lets you know the product’s score on a scale of 0 to 10, with 10 being the most toxic product. Be sure to look at the details since some ingredients can flag the database’s scoring system for a higher score even without using unsafe chemicals. These are usually ingredients that, although generally safe, can cause an allergic reaction in some people. 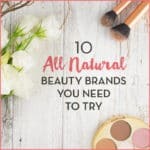 So where can you start in your search for chemical-free brands? Colorganics, Lavera, World Organics and Inika are all well-regarded and use only natural ingredients. Once you know where the problem products are in your current stash of cosmetics, lotions and products, you can start to slowly swap out certain ones. Look for cosmetics that clearly list all ingredients, even those used to scent the product. Cosmetic companies like Lavera and Inika mentioned above are a good starting point, or you can try your hand at making your own cosmetic products if you are adventurous. Many of these chemicals do get flushed through your body, but some can accumulate. If you’re using more than one product that is full of these chemicals, you’re getting a much bigger dose. Try making your own homemade makeup! What do you think? Are chemicals in your cosmetics something that concerns you? What brands do you swear by? Should You Switch to All-Natural Deodorant? Beautycounter has the strictest ingredient screening process in the industry. They ban 1500 ingredients from all their products. Everything is not only safe but high performing as well. Their mission is to get safe products into the hands of everyone.